Johnson & Johnson (JNJ) has become a fan favorite in the investment community. Its strong balance sheet, collection of impressive brands and consistent dividend all give long-term investors a reason to stay with the name. So with earnings on tap Tuesday morning, should investors be nibbling JNJ stock? For the upcoming quarter, analysts currently expect earnings of $2.04 per share on revenue $19.61 billion. Should Johnson & Johnson stock hit these consensus expectations, it will result in a year-over-year (YoY) decline of 4.9% and 2%, respectively. When it comes to the full-year numbers, analysts are looking for revenue to fall 60 basis points YoY to $81.05 billion, but for earnings to grow 4.9%. In both metrics, the ensuing quarters are supposed to get better for JNJ. Better-than-expected first-quarter results could lift the estimates for the rest of the year. Consider the fact that JNJ stock has beat both estimates for six straight quarters and this becomes a real possibility, although management’s outlook will certainly be important. Will this be enough to lift the stock? We’ll find out on Tuesday. The 2019 growth profile isn’t all that impressive for Johnson & Johnson stock, although the numbers for 2020 are better. Analysts expect revenue growth to turn positive and expand by 4.3%. Earnings growth is forecast to accelerate from 4.9% to 6.5% in 2020 to $9.14 per share. Based on this year’s numbers, JNJ stock trades at just under 16 times earnings. Ordinarily, paying 16 times earnings for negative revenue growth and sub-5% earnings growth is unattractive, to put it kindly. But JNJ is no average name. The company has a strong balance sheet and steady cash flow growth. At the end of fiscal 2018, operating cash flow stood at $22.2 billion while free cash flow stood at more than $18 billion. These are impressive numbers and help explain the strength behind its dividend. Now paying out 2.65%, it’s not the largest yield on Wall Street, but it’s one of the most dependable. JNJ stock hasn’t just paid a dividend for more than five decades, but it has raised its payout for an impressive 56 consecutive years. While this lags other dividend studs like Procter & Gamble (NYSE:PG) and 3M (NYSE:MMM), it shouldn’t be ignored. Further, that dividend should get another boost this month. J&J does have an issue with its talc powder products and ensuing lawsuits. While that may cause bumps along the way, it will not be the iceberg that sinks the ship. JNJ stock will live on, and long-term investors shouldn’t be shaken from their position on that worry. On that note, let’s look at the charts. After a strong rebound out of the December lows, JNJ stock has been consolidating under $140 for more than six weeks now. $140 is clearly short-term resistance, while $135 appears to be support. Worth mentioning is that the 61.8% retracement for the 52-week range is just under $136, a level JNJ stock had been struggling with over the past few sessions. On Monday the stock jumped over this mark, although it’s still below both the 20-day and 50-day moving averages. This sets up an interesting situation for JNJ stock now. Will the earnings results be strong enough to justify a move over the 20-day and 50-day moving averages? If so, I want to see how it handles $140. 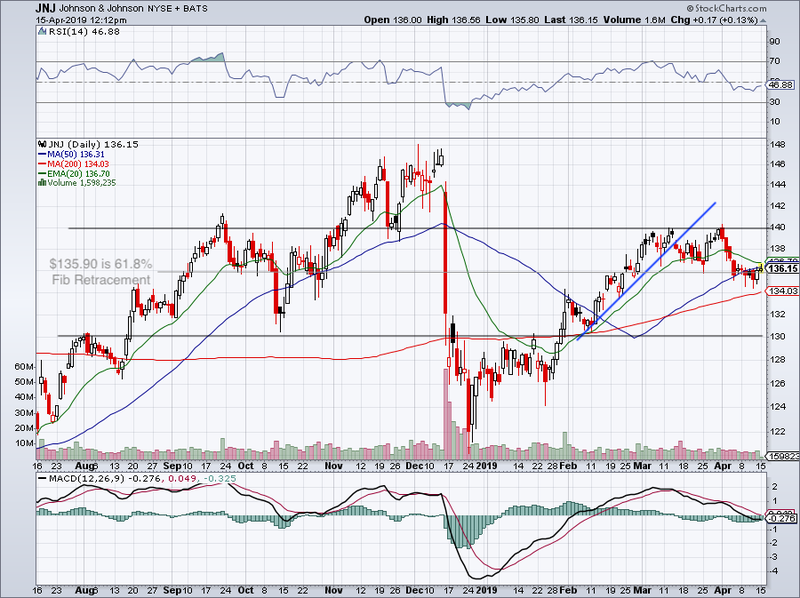 If JNJ gets over this mark, I want to see $140 act as support going forward. Should JNJ stock pull back instead, I want to see how it does against the 200-day moving average and possibly lower at $130. Between $130 and $140 and shares can stay rangebound, while a move outside of that range can create a change in character in JNJ stock. In short, it can create either a breakout or a breakdown. We’ll know more on Tuesday. Traders should wait to see the results from earnings, while some long-term investors may feel comfortable adding to the name ahead of time.